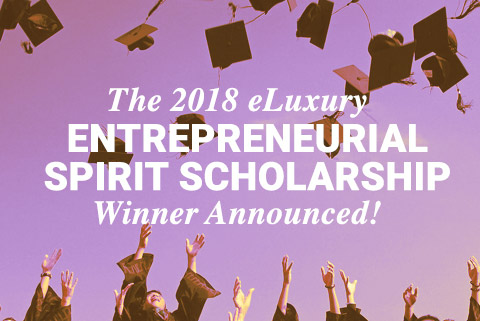 eLuxury.com is pleased to announce that Alyssa Ardai of Malden High School in Malden, MA is the winner of the 2018 Entrepreneurial Spirit Scholarship. Alyssa was chosen from a number of applicants vying for the $1500 scholarship meant to, "help one up and coming entrepreneur focus on achieving their scholastic goals and their aspirations in a career in business, marketing, or related field." Applicants from all over the United States applied directly on the eLuxury.com website and submitted essays that detailed their future entrepreneurial plans and goals. eLuxury.com wanted to "help offset some of the high costs associated with attending college and assist one up and coming entrepreneur to focus on achieving their scholastic goals and their aspirations in a career in business, marketing, or related field." Alyssa currently attends Malden High School and was chosen from a number of high school and college students who submitted essays that detailed how they will use the funds to further their education, how they will pursue entrepreneurism after completing their degree, how they plan to begin contributing to the business community as well as local, national, and global communities, and how they plan to innovate in their chosen field. eLuxury.com was founded in 2009 by entrepreneur and Chief Executive Officer, Paul Saunders. Saunders says that the spirit of entrepreneurship was the driving force behind the growth of eLuxury, so he wanted to give back to a future entrepreneur. "There is a new generation of entreprenuers preparing for or currently pursuing higher education and we wanted to help one of them to offset some of the high costs associated with it," said Saunders. Saunders says that eLuxury, as a company, wanted to help foster the entrepreneurial spirit for a student in the same way in which they do with vendors, customers, and their employees, all while helping to re-imagine entrepreneurship for a new generation. "We hope that this scholarship will help Alyssa to pursue her interests, excel in her chosen field, and become one of tomorrow's entrepreneurial leaders," Saunders said. eLuxury.com is a United States Veteran Owned and Operated company based in Evansville, Indiana that has become one of the internet's most trusted and successful luxury bedding, bath, and home superstores. For any questions, comments or concerns, please call 1-800-977-7433 or email service@eLuxury.com.